FRANKFURT, Germany, March 15, 2006 (UPI). With tenacity and leadership he fought the odds. While others doubted, he believed. While others scoffed, he pushed forward. An Afrikaner, a European and an African — F.W. de Klerk knew democracy must belong to all South Africans. “It seems a world ago,” said a ranking Irish Diplomat recently, referring to the end of Apartheid. “It is indeed remarkable how far South Africa has come. This would not have been possible without de Klerk’s vision and sense of purpose. De Klerk travels the planet with the energy of a man half his age. He sees and solves problem situations long before they turn into a crisis. He is a man who founded and presides over two institutions, the Cape Town-based F.W. 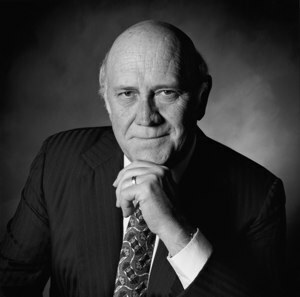 de Klerk Foundation and the London-based Global Leadership Foundation. He is the honorary chair of the Prague Society for International Cooperation, on the advisory board of the Global Panel Foundation and an active voice in the prestigious Forum 2000 Foundation. When I met de Klerk in London last week he was full of plans. No longer a smoker, I missed our “smoker’s moment.” As we sat down to lunch at the marvelous Colonial Restaurant, I was taken by his presence. Even in person, he exuded that aura that belongs to a great personality. And, like most great personalities, he was gracious to the point of self-effacement. It has been seven years since our first meeting in Prague at President Havel’s Forum 2000 conference. Even then, his calm down-to-earth self confidence impressed me. He had stepped outside for a cigarette, and I happened to be the person standing there at the same time. He smiled, lit his smoke, and proceeded to ask me who I was. I explained that I was the gentleman who would be hosting him for dinner later that evening. “Well, sir,” I retorted, “so are you.” We laughed heartily. It was the beginning of an association marked by great affection. That evening, at the Prague Society’s first Public Policy dinner, President de Klerk spoke of his trials and tribulations as the leader of South Africa. He laid down his vision for the next part of his public policy career — to focus on peace, democracy and development. These values would lead to the creation of both the de Klerk and Global Leadership Foundations. De Klerk brings immense passion to engendering relations between multi-cultural societies. He is consistently promoting the rights of minorities. He travels hundreds of thousands of miles each year committed to the future of South Africa and the African continent. He is especially committed to the developing world and emerging markets. In any given week, he will travel from Africa to Europe and back, stopping along the way in the United States. “Just a slight detour,” he noted with a wry smile. “You know, Marc,” he said at lunch, “I expected to slow down when I retired from active politics in 1997. Frederick Willem de Klerk was born in Johannesburg, March 18, 1936. His father was a respected Senator and senior Cabinet Minister. He spent most of his school years in Krugersdorp, matriculating at Monument High School. He attended Potchefstroom University for Christian Higher Education, graduating with BA and LLB degrees in 1958. This background would play an immense role in his courage to change South Africa. In 1978, he was appointed to the Cabinet — only 42 and having served a mere 5 years as a back-bencher. In the ensuing years he would hold numerous portfolios including Posts and Telecommunications; Social Welfare and Pensions; Mineral and Energy; Internal Affairs and Public Service, and finally National Education before becoming President in 1989. He would remain President until 1994. After the 1994 general elections, he would become Executive Deputy President in the government of National Unity led by President Mandela, a position he would hold until the end of 1996. F.W. de Klerk was only 57 when he received the Nobel Prize, with Nelson Mandela, for his vision and courage. It was a most deserving prize for a man who lived the change he promoted. It was a most deserving prize for a man who is a living zeitgeist. On Saturday de Klerk turns 70. He is, along with Carter, Gorbachev, Havel, Peres and Thatcher — one of the world’s last great statesmen.